Paul, the owner of A Blaze of Color, contacted us a few days ago saying he was ready for us to host his website and manage his domain name. Several months ago, he had us create a new website for his paint contracting business and he was blown away with our responsiveness and how quickly we got his new website going. He said that whenever his hosting account was about to expire at BlueHost, he would transfer everything over to us to manage for him. Today, he placed his order and we have moved over his website and added a few pictures to his gallery. The domain name transfer is pending and will be completed within seven days. Since Paul’s website is now moved over to our servers, his website loads more than twice as fast compared to the loading times when it was on BlueHost. We appreciate the continued business from Paul! 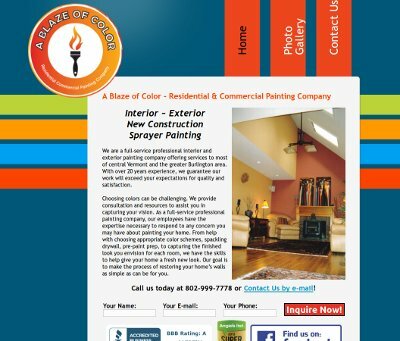 A Blace of Color’s website is at ablazeofcolor.com.